These are properties without homes but with ample land to enable you to snowmobile, hunt, plant some crops, or keep a few head. Or maybe it's simple living and peace and quiet you want. And you'll find a good building spot when you are ready for that. Once in a while one here will have a barn. The properties immediately below are samples of what we have recently sold. If you have questions, by all means ask. We want to make your buying experience a great one! There are weedy areas by the roadside (660’ of frontage, power at the road) which give it a feeling of great privacy. You will enjoy peeking at the views from the back fields too. There are 2 small ponds and the terrain is mostly fairly level though it does roll a bit in one area. 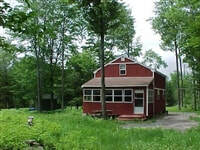 #1114 - Central Fulton County - Nearly 200 private Adirondack acres, wooded except for a 2 acre clearing by the lodge. Small streams, a large beaver pond, trails throughout - and it backs up to State Forest land. The lodge has a composting toilet and a shower, with a loft to sleep 7-8 folks. It is in very good condition, with a new roof, and is insulated for year-round use. The dug well has not proven reliable, so if you want to use this as a residence, you'd best plan on drilling a well. There is also a small storage shed and - get this - a new log-sided solar outhouse! At $175000, this would have been a buy hard to find in the 1980's, and is unheard of today. Questions? Want to visit? Call Pete Hemmerich at 315-429-0950. SOLD #1117 - South Central Herkimer County This 89.5 acres is mostly open and mostly planted in soybeans and rye. Big broad nearly level fields combined with high lime soils make it an impressive piece of land when you see it. The east end has thin soils as evidenced by bedrock exposed by some sort of minor “quarrying” and is not considered tillable. This area is brushy or lightly wooded. Elsewhere there are only woods where the terrain briefly gets steep - most trees there are Sugar Maples. There are a few acres that are tillable which are not used by the tenant - my estimate is that someone could crop up to 70-75 acres here. You will find views extending 10-20 miles to the southern Adirondacks to the north and to the Otsego County hills to the south. This is one of the benefits of a higher elevation. There is very nearly 4000’ of road frontage here on both Town and County roads. Despite a lack of heavy woods, I found lots of deer sign here. #1101 Central Montgomery County - 55.5 acres with a long frontage (1272' in fact) on a paved county road boasts a small stream, a good woodlot along with a much smaller amount of former fields, now brushy. Power is by the road. There is a 12x16' shed for storage on the property. Make your own maple syrup here. $94000. #1105 - Northwestern Montgomery County. “Sitting on top of the world”. Large tract of land for hunting and farming at the very end of the road - and there’s 248 acres of it. A very good Town maintained gravel road leads further in toward the center of the property. The owners says there are 133 tillable, but it looks like more than that to me. This is very good land and it is currently all in soybeans, rented to a local farmer. Soils are Amenia, Nellis and Lansing silt loams with a bit of Wassaic thrown in. If you investigate, you’ll find they are some of the best that this part of New York can offer. And they are mostly southern exposure, nearly flat when not south-sloping. The non-tillable land is nearly all in mature mixed forestland; there is only a small part near a pond site that I’d call “pasture”. You will love the sweeping panoramic views. You even can see the elusive Mohawk River from here, it is so good. 955’ of frontage on 2 roads. And the fields are large enough and flat enough that by cutting through some hedgerows, you could land a plane here if you only had one. Mother Creek passes through the land as well. There are springs in several spots. The owners, who live some hours away, have decided that this is the right area. but it’s way too much land for their purposes. Taxes are $7000. #1053, North Central Montgomery County - 75 acre parcel in the heart of Amish Country. Minutes to town or the Thruway. The owner says he has 45 acres of open land of the finest soils the county offers. About 30 more are wooded, with a sugar bush with harvestable maple & beech if you want timber. There are also quite a number of magnificent hemlocks This woods has the best pink Trilliums I have ever seen and it is teeming with deer and turkey. There is a never-failing stream through the property. It lies on both sides of a dirt road and has all the quiet and privacy one could wish for. Many outstanding home sites, all with great views.